Luigia Gio Martelloni: Breathing, detail. Call it conceptual nostalgia for the present. Or allegorical landscape history. Or diaristic arboreal cartography. What photographer, painter, sculptor, filmmaker, and installation artist Luigia Gio Martelloni pursues, across and in-between an array of studio mediums, is a unique hybrid of academic training, personal impulses, and formal influences that run the gamut from Old Master painting to Neorealist cinema and the poetic found-object innovations of the post-War poveristas. Luigia Gio Martelloni: Breathing, Gallery 825 installation view. Her totemic go-to is the world of trees of all species, which she views as emblems of specific places she has been, where life events of deep significance and captivating fleeting moments transpired. She does not anthropomorphize the trees as is familiar in the parlance of painting and poetry; rather they serve as markers that transcend time to trigger memories in a Proustian language known only to herself. Yet despite the inscrutability of her private narrative, the operatic vernacular energy of her work communicates in an almost metaphysical sense that the viewer is free to use the work to remember their own stories; there's plenty of room in her deliberate and esoteric pictorials for everyone's consciousness to take root. 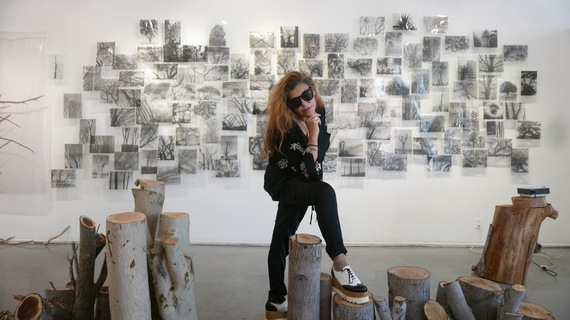 Her aesthetic is both breezy and grounded, with black, white and earth tones predominant, an affection for negative space and projected shadow, and the inclusion of flamboyant objects from nature, especially chopped wood, dried branches, fronds, and bark -- pieces from the literal world invited back into the discourse alongside their own depictions. These juxtapositions are graceful and awkward, unexpected but accessible attempts to shift the quality of the viewer's attention to include original direct experience in their interpretation of the imagery. In Breathing, which is both an exhibition and an installation design, a singular whole and an orchestration of parts, Martelloni offers multiple material pathways into her thought process, involving by turns all her strategies of art-making. 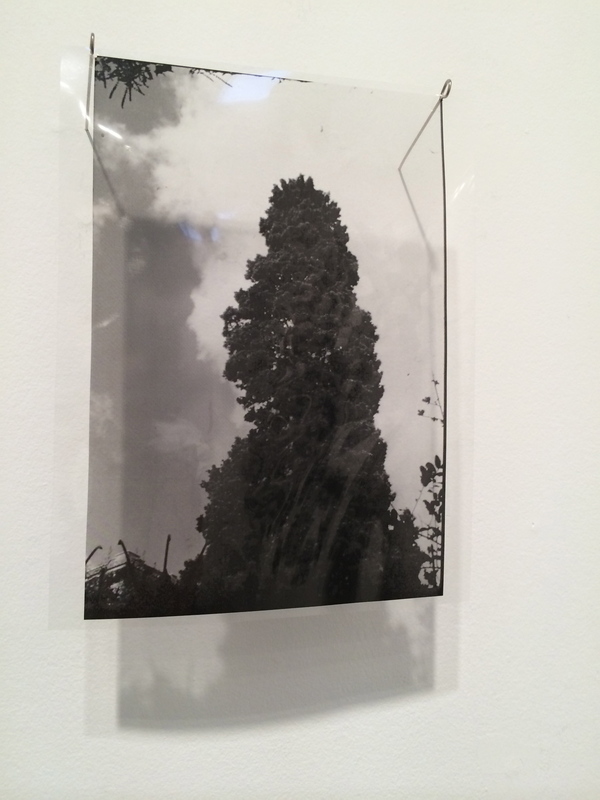 Luigia Gio Martelloni: Breathing, and Stand Up Memory, installation view at Gallery 825. 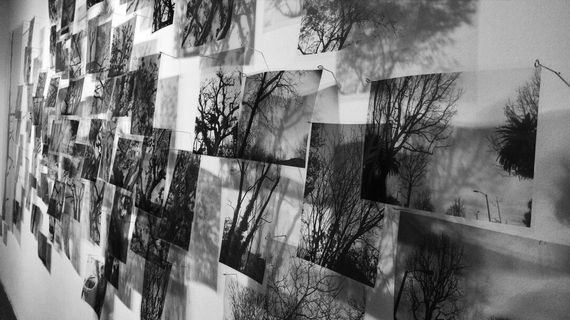 The eponymous installation Breathing (2015) is a splay of 150 black and white photographs on transparency plus a projected video. 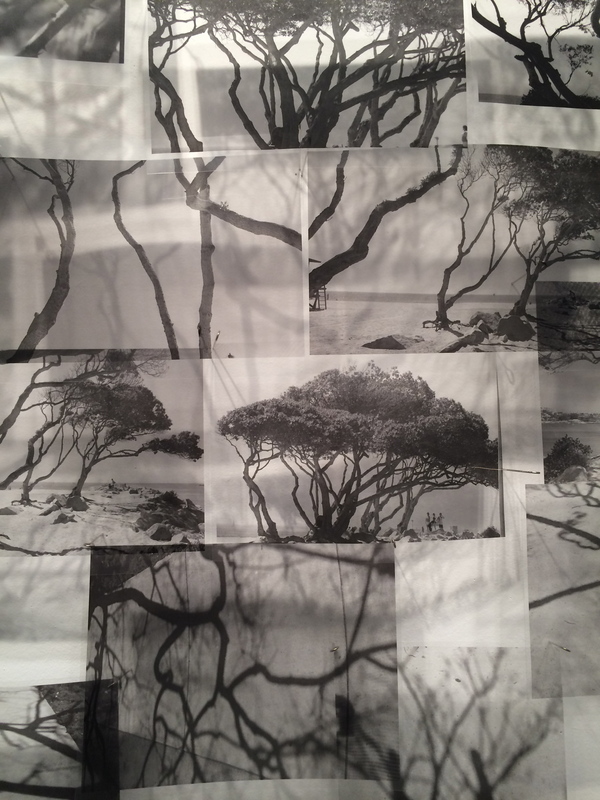 Taken as a single installation, the photography has a certain fractal balance that feels like an organic randomness, but in fact is mapped out and installed in a specific order designed to highlight occasional correspondences between groups of two, three, or several frames, and evoke the overall design of a sprawling tree in its intuitive armature. Trees in this array come from various species, evergreen to deciduous, blooming or barren, silhouetted against the sky or seen in close-up detail. The video was shot on film, with no post-production, its audible projection equipment and elusive soundtrack of footsteps, and its analog frame rate creating a lightly percussive, flickering light and sound experience that echoes the breeze and flutter of the prints fluttering gently off the wall. It shows the dappled light of sun filtered through leafy treetops. It contains no narrative yet retains the emotional impact of the place where it accesses the collective subconscious. Traces (2009-2016) is a grid of 24 x 20 black and white unique painted prints on paper, referencing the modernist minimal tradition of monochrome painting. Like the transparencies in Breathing, they are hung pinned rather than framed, so that they sway and rustle within their breeze-tussled grid. All of them are selections from the same archive as Breathing, but the larger scale and opaque, tactile chalk and ink object quality of the prints themselves gives a far more physical, ancient, tactile perspective on the same content. This impulse for extreme tactility is evocative of Anselm Kiefer with his straw, Walter de Maria with his patches of fragrant earth, and Andy Goldsworthy with his aesthetic interpretations and direct material appropriations of Nature. Luigia Gio Martelloni: Along the River. 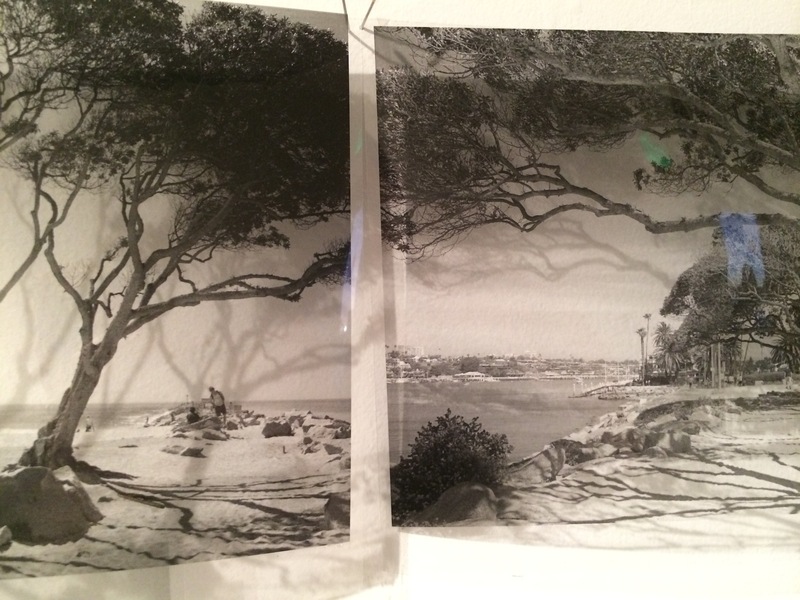 Luigia Gio Martelloni: Castore & Polluce, installation view. Works like Not Just a House, Fragile Beauty, Along the River, Castore & Polluce, and Stand Up Memory -- these are all works that incorporate branches, peeled bark, paper as a ground even in large scale and other like materials that sustain the overall metaphorical motif of evolution, revolution, and continual transformation within and between the humanity/nature continuum. In the tree-size Castore & Polluce in particular, her use of paper and bark -- really two manifestations of the same element, harvested and modified -- both depicts and embodies this dynamic. Martelloni frequently further incorporates chopped wood, along with collected crystals and mineral stones, ceramics, and meaningful talismanic found objects into her dimensional compositions. In works like Stand Up Memory, the entirety of the intimately monumental sculptural arrangement is made from recently collected and chopped fresh, young wood. It is both a melancholia of the living and a memento for the dead; it is an aromatic, tactile, serenely visceral contemplation on revolving stages of existence; it is a piece of transitory sculpture whose emotional impact comes both from its physical actuality and its enduringly esoteric metaphorics. Contemplating the whole of Martelloni's scope of investigation, one gets the sense that this cyclical journaling could manifest itself forever; after all, trees outlive humans by centuries, and keep their own infinite secrets. Luigia Gio Martelloni. Photo by Eric Minh Swenson. Breathing is on view through October 7 at Gallery 825 in West Hollywood. Follow the artist on Instagram or at her website to learn more.